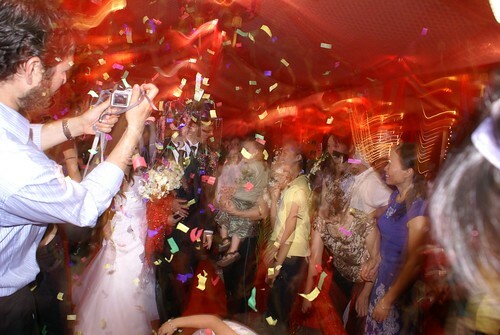 A celebration, a wedding, a joining of the lives of two people, culminates the planning of a year’s concentration. A party: two person’s lives join together into some notion of futurity which is the faith of their ongoingness. Preparation, the imagination of friends and families somehow getting to the same place at the same time. A kind of public fantasy, the twenty years of youth growing up, growing to be and to become another person, an intellect, a thinker and doer; now, two thinkers, two doers, deciding to be together in the whatever that is a marriage. Still their parents’ children, still children to their parents. Yet a who, a what, a something in its own times and place. Bread, a feast, wine, dance, the beauty of bridehood fixed upon our memories into tomorrow’s hopes and each new day’s is and was, would and will be.